She is shocked when a few weeks later she bumps into Rhinehart himself: very much alive, married, and Christmas shopping at Bloomingdale’s. What ensues is an intense and beautiful friendship, an unexpected second act that pushes Terry to finally reckon with the consequences of their past and the depth of her own aspirations—and to begin to come back alive as an artist and a woman. 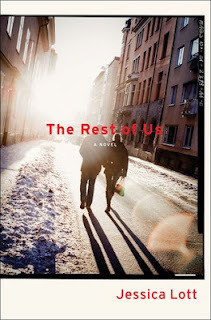 The Rest of Us is described as a novel about second chances. While that is certainly true, I found that it's even more about relationships. The people in our lives have an impact on us that we can hardly begin to imagine. Terry and Rhinehart almost need each other to create their art. Between their early affair and their second chance relationship they both seem to be stagnant. Artistically yes, but in even larger ways. When they being seeing each other for the second time they both begin to flourish. At first I didn't sense a great passion between these two characters. The further I read the more the closeness and love became apparent. There is a push and a pull between them that reads as very convincing. Their relationship is complicated. The best kinds usually are. My favorite relationship in The Rest of Us is between Terry and her best friend Hallie. Their history is rich, complex, and believable. Poetry and photography take central stage in this book. I'm not an aficionado of either of those art forms but this book made them accessible. Beautifully written with raw sensibility, The Rest of Us has a rhythm all its own. It sounds like you and I have been reading similar books! I think you could read this one in tandem with Sight Reading to look at the relationships of artists. Sight Reading is definitely a book I'm interested in. When I read a book about any kind of art I need it to be accessible to me as a non-artist. When I recently read A Complicated Marriage (about an art critic and his wife) it felt over my head. I don't know how to put my finger on the differences between these books but I GOT this one. I'm glad you mentioned that, because I was wondering how similar it would be to A Complicated Marriage. Now I'm all curious about why there was an obituary when Rhinehart was very much alive. This one sounds good. Definitely sounds like a book I'd love. Thanks for the review! I think you would Deb :) You're welcome! The relationships this book explores sound interesting. They really are! I was very pleased with the authenticity of the relationships in this book. This sounds like it might make a good book club choice. Yes, I could see that. There would be plenty of topics to discuss! This sounds like a book I'd really like. I've read several that examine a relationship with a student and some sort of artistic professor, but I like that they have this second chance opportunity for friendship in this novel. Good stuff. Right! It's very different from other books with that same sort of theme. Good stuff indeed! What a beautiful review! While it sounds lie an interesting read, I'm not sure if it'll be my cup of tea. Maybe one day when I've gone through all the other books on my shelves. Thank you :) I understand how that goes! So many, many books! I enjoy poetry, but some I don't understand. It sounds like you really enjoyed this book! This sounds very good, I like that poetry and photography play a part. I'm a lover of photography so I might like that aspect of this one.